How was my weekend? So glad you asked. In terms of well-rounded quality, Saturday was pretty close to perfect. Delivered a couple of speeches to the Travis and Bastrop county Democratic Party conventions. Got confirmation that Central Health (the Travis County health care district) and Seton Healthcare Family have tentatively signed off on a revolutionary agreement that will transform health care, the economy and quality-of-life in this region. Watched the Austin High lacrosse team win a great, tight divisional playoff game, 7-5. By just about any measure, that’s one fine day. So I celebrated. By eating – a lot. And I liked it. My new, light-weight lifestyle took a beating. And I don’t care. My theory is that, with all that food consumed, I came away from Saturday even more well-rounded. There’s lots to discuss this week regarding our effort to create a multitude of health care resources in Austin – including a medical school, a modern teaching hospital, uniquely Austin health clinics in our neighborhoods, cutting edge research resources, and other parts of the 10 Goals in 10 Years I’ve been talking about for a few months now. But first, we need you to tell us your story. Specifically, please go to this brand new web site and write about your experience with health care in this community. Maybe you or someone you love got great treatment here, and you want to be sure others can get it too. Maybe Austin didn’t have the resources you needed, and you or a loved one had to go to Houston, Dallas or somewhere else for care. Or maybe you just have a unique insight into the needs of this community and ways to address those needs. We all want – and we need – to hear what you have to say. Yesterday, I joined a number of folks to launched HealthyATX. This is a group that believes the best thing we can do for ourselves, our families, our economy, and our Central Texas community is invest in our health. It’s working to create a community-wide discussion about what our health care needs are – and what our options are for meeting those needs. And a huge part of that process will be hearing from folks like you about your health care experiences. HealthyATX is starting with one health care story: mine. You can watch it here. As I say in the video, and as a whole lot of you already know, I’m a cancer survivor. In a lot of ways, I probably ought to be dead already – maybe a couple of times over. But I’m here because of early, effective and frequent health care. That’s part of the reason health care is such a passion for me. And I know there are thousands and thousands of others in our community who feel just as strongly, and whose stories are just as compelling. So go to HealthyATX.org. Tell us what you’ve seen and experienced. 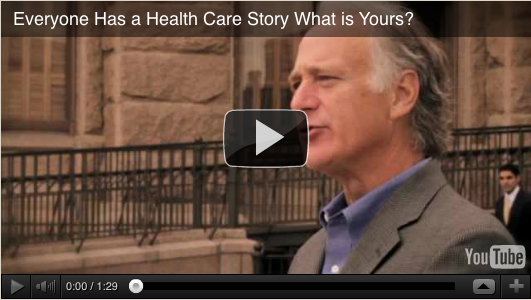 Because we all have a health care story. As I said above, Saturday was a special day. But not just for me – I really believe that for years to come, folks will look back on April 21, 2012 as a transformative day in the life and health of Austin and Travis County. On Saturday, the Seton Healthcare Family and Central Health signed a landmark agreement, known as a Letter of Intent, that will help create a new way of delivering health care in Austin. I wrote a pretty comprehensive memo providing some historical perspective and details about the Letter of Intent, and you can find that here. You can also read an article summarizing the agreement here. The arrangement re-vamps the public/private partnership through which Seton and Central Health have been serving this community for years – and especially the under-served and uninsured “safety net” population here. It solidifies the foundation of our health care system for the 21st Century by integrating various components of that system. And it leverages resources so we can potentially draw down as much federal health care money as possible. The centerpiece of this effort likely will be a joint effort to build a new public hospital to replace University Medical Center Brackenridge. Brack is a proud facility that’s served this community well. But as a recent study from two distinguished national experts demonstrates, the years have taken a toll and the hospital simply doesn’t meet current needs, let alone the increasing demands of the 21st Century. A new teaching hospital could be paired with a new medical school in Austin to provide better care and increased access for everyone, as well as a considerably stronger safety net for those who rely on it. That pairing will also increase cutting-edge care and reduce the need for travel to Houston or Dallas for treatments. It will help with research into new biotech products and efforts to bring those discoveries to market – to the huge benefit of the Central Texas economy. And it’ll help train new generations of doctors and medical students – and help keep them in the region (which is falling behind when it comes to the doctors we have and the doctors we need to serve our population). This is an exciting time – and, as such, a timely effort. Seton and Central Health should both be proud of the work they’ve put in and the additional work that’s yet to come. There’s still lots to be done, and lots of details to be addressed. Among other things, it will take a vote of Seton’s parent organization’s board to make money available. And the Central Health board faces some big decisions too. But big steps have been taken. There’s lots to celebrate. Because, as I said earlier, everyone has a health care story. And for all of us, as a community, this is going to be a big part of ours.